Cord blood banks promise that saving your baby's umbilical cord blood is an important form of insurance for his or her health. Cord blood can be used to treat leukemia, lymphoma, and certain genetic and immune system diseases. However, no one knows how long it can be stored, harvesting and storing the blood can be costly. In order to determine whether this service is something you want to purchase, it's important to understand all the facts. Cord blood is the blood remaining in the placenta and umbilical cord after the umbilical cord is cut at birth. It is rich in a special kind of stem cells which are similar to ones found in bone marrow. These hematopoetic (blood-making) stem cells can make all the different kinds of blood cells that a person needs. Cord blood does not require as close a genetic match as bone marrow, so doctors will sometimes use it when a bone marrow donor cannot be found. Researchers are also studying whether these cells can be used to treat other diseases like Type 1 diabetes or brain injury. In the past, cord blood was simply discarded after a baby's birth, but as doctors have discovered its value, they have developed techniques to store the blood for future use. Some parents choose to donate their baby's cord blood to a national registry, so it will be available to any family who needs it. Others choose to pay a private bank to store it. 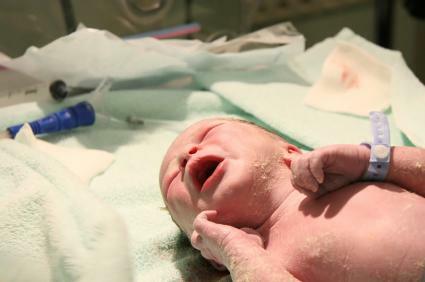 In most cases, the cord blood is still discarded, either because parents do not choose to save it, or because the birthing place is not equipped to do so. If you do choose to store your baby's cord blood, you have a couple of options. If you are interested in allowing anyone to use your baby's cord blood if needed, you can donate to a national registry. The National Marrow Donor Program has a listing of participating hospitals; you need to make sure that the hospital that you use to deliver can actually perform the procedure. You will also have to complete a detailed report about you and your partner's health and disease history before donation. If you choose a private bank, you will need to contact them at least 6 weeks before the birth so that the bank can send out a collection kit for your provider to use. You need to discuss this with your doctor so that they are prepared to complete the task in a timely manner after the birth. After the blood has been collected, the parents have to arrange for the kit to be sent to the company - typically through a medical courier. The bank will test the blood for infections and contamination. You will receive notification so that you know that the package was received; some companies will also send you the results of the lab tests done on the blood. The website A Parent's Guide to Cord Blood Banks has a listing of private blood banks that you can investigate when making a decision. Families with a history of genetic conditions or autoimmune disorders may want to think about banking. However, a discussion with physicians and genetics counselors can help make this decision. Unfortunately, if a child develops an illness requiring a transplant, odds are that the seeds of the illness are already present in that child's cord blood. Genetic problems, for example, are in all of the child's cells, including the cord blood. Most doctors won't use a child's own cord blood to treat leukemia, because cells predisposed to leukemia may already exist in the cord blood. Certain adult diseases could, in theory, be treated with a person's own cord cells. However, there may not be enough blood cells in the sample for an adult. In the future, technology may exist to multiply the cells. It's also possible that, someday, cord blood will be useful in ways we don't yet understand. For now, if a child needs a cord blood transplant, it's more likely to come from a sibling or be donated by another family. When a patient needs a bone marrow transplant, doctors look to family members first. Bone marrow transplants require a very close match of certain genetic markers. There is a one in four chance that a sibling will match perfectly. Because it doesn't have to match as closely, a healthy sibling's cord blood is even more likely than bone marrow to be a good match. At least for now, cord blood can't be used in all cases requiring bone marrow transplants. Also, there's still a chance it won't match even if it is needed. However, some parents feel that it's worth making the effort to store the cord blood. Cord blood is frozen at very low temperatures. No one knows for sure how long it lasts, because cord blood banking is still relatively new. Samples have been thawed and found usable after ten years of storage. Theoretically, if it's properly frozen, cord blood should last much longer. There is no charge if you donate your baby's cord blood to a public registry. If you choose to save it for your own family, charges begin around $1,500 for collection and storage. You can expect to pay an annual fee of about $125. If you have a child or other family member who needs a cord blood transplant, and you are expecting a baby, talk with your insurance provider. If a transplant is appropriate, insurance may cover both harvesting of the cord blood and the transplant itself. If you have a child with an illness that makes the need for transplant likely, there are a few organizations which will provide free preparation and storage of your new baby's cord blood. The National Marrow Donor Program may be able to connect you with an organization that can help. The American Academy of Pediatrics does not recommend private cord blood banking unless it's clear that the child or someone in the family is likely to need the blood. Instead, they recommend donating the cord blood to a public registry. Families of minority or mixed ethnic backgrounds can sometimes have a hard time finding a matching donor. Families like this may want to donate cord blood so that it will be easier for others to find a match, or they may choose to keep the cord blood in case a family member needs it. The odds of your family needing this blood in the future are small, but that doesn't mean that saving your child's cord blood is a bad idea. You should do your own research and discuss the issue thoroughly with your doctor before making a decision. The correct decision may be different for each family.